Innerpersonal Hormone Therapy. Making Sense of Nonsense. A blog started today as I was clearing the dishwasher. (Yes, I hear voices and they often become blogs…. ) The blog (voices) started like this…. A proclamation to my children…. 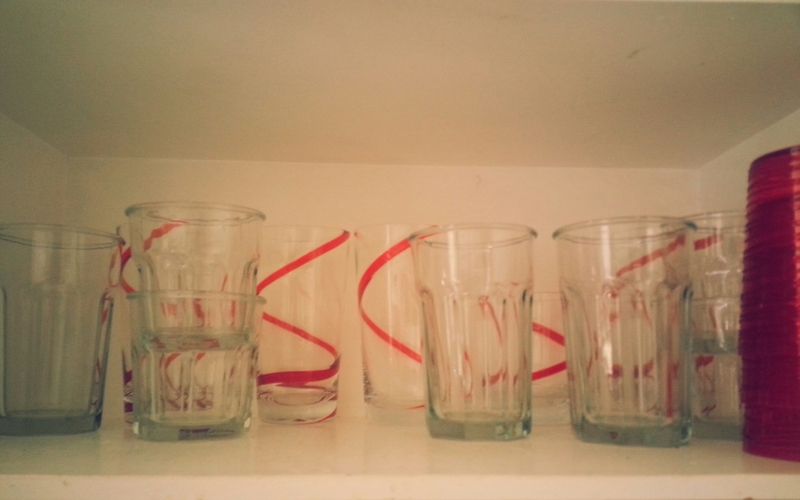 “Yes, I must admit, I secretly put all my cute red stripey glasses in the very back of the cupboards and bury them with the non descript plain glasses in hopes that you will not choose them and break them.” It was at this point I realized I might be a little TOO attached to my red stripey glasses. This is where the argument (in my head …. said in a “Ya! I know I’m crazy voice!) began. Voice 1- You need to let go of your attachment. They are just things! Voice 2- “You’re not too attached… you just want to have cute things. It’s ok to be attached to them, love them and do your best to hide and preserve them. After all, you started with eight of each size and now you’re down to six total!” Then the tears welled up and I felt that tight lump in my stomach form and start warming its way up and out of my eyes. Then it over filled and the tears began….. Whoa!!!! (Insert sound of record scratching here…rriihhrr riihhrr.) Time to take a time out and a little step back to do some observation, some innerpersonal therapy.…. If cute stripey glasses can bring me to tears….. there MIGHT be something to look at here. The truth is, I had felt this “verge of tears” feeling since I had woke up this morning. It was a mix between “I’m about to burst into tears mixed with I’m grumpy and I don’t want to talk about it” …. Coupled with, “Hug me! But DON”T TOUCH ME.” Has anyone ever felt this way???? It’s the makings of CRAZINESS!!! This morning I simply felt “sad” mixed with a little bit of “grumpy”. It was just an emotion. I natural and normal human emotion, sad and grumpy…. It’s not somewhere you want to live but it happens from time to time, no need to judge. When Trent asked “Why do you feel sad?” I had no response. No reason…. I just felt sa-rumpy (that’s sad+grumpy in case you were lost). Now, when this emotion knocks on my door and wants to come in for a visit, my number one rule is that I don’t get to “GRUMPY” all over everyone else just because this emotion has stopped in for a short holiday with me and I don’t stuff the feeling either or it gets way worse. I just notice it and know that today might be an ipod earphone wearing day, with little social contact. <– It’s so important to KNOW your shadow personalities to protect the innocent loved ones that surround us!! SOOOOO…… What I noticed when I stepped back and observed, was that my emotion was actually NOT tied to any of these scenarios until my unconscious mind needed to answer the question “Why do I feel sad and grumpy?” Then….. I was offered so many choices of all the horror stories from my past…. I was off to the races. Now, let me take a step back here and say….. I know there are times in our life when rough things happen and these things may create our emotions and that’s a totally different blog post but this one is about how we sometimes create our own drama!!!! Our own nonsense!! How many times is it just simply an emotion because we are human….uh er… WOMEN….. that have a flux of emotions tied to hormones and we feel we NEED to have a reason and a justification to feel this way so we dig up our past history, those scary stories and we roll all around in it and then start spreading the infection to all our loved ones. It’s not long before we “grumpy” all over everyone near us… EW!!! The key is to KNOW THYSELF!!! Observation has taught me to step back and check myself before I wreck myself…… so next time you hear a blog starting in your head about your attachment to cute red stripey glasses and it brings you to tears….. you might want to step back and do a little observation to see if you just need a day of good music, a good book or some yard work away from the public. (I can totally tell when I’m not really socially acceptable…. and I take advantage of some me time!) There doesn’t need to be anything “wrong” we might just be experiencing a natural human emotion linked up with some hormones and Thank GOD!!! This too shall pass. I smiled and shook my head in understanding. Now, you can see that he ran to his scary stories too (and that gets to be his accountability if he wants to look at it) but he ran there with pretty good justification. That’s why I shared the story above. I always want to be accountable for myself and knowing what my emotions are and how to handle them is so incredibly key for me. I also want to make sure I am managing my hormonal emotions correctly so that I don’t start emotionally swinging at those I love just because I have a little turmoil going on inside…. That’s really not fair. Women!!! It’s up to us to change this stigma and be accountable for how we act. So I want to hear from you!!! Have you ever experienced something like crying over cute stripey glasses and then finding every excuse on the planet as to why you are sad and/or grumpy…. Just to find out it is PMS?? How do you handle it? What are the tools you use to make sure you don’t stuff your emotions but also don’t unnecessarily flip out on those around you.